people would want to see? Was it a scary idea? which I enjoyed, but didn’t personally relate to as my own personal form of expression. foresee more members joining at some point? as I was nervous about just playing to an electronic dance audience with a floor tom. matter what, he is my core guy, my Mick Ronson, my Steve Merchant! amazing music! But yes the future will involve many players. forward rock, at least by comparison? and Devlin and I cherish those tracks. I would meander a bit. rather than abstract electronic music, or painting, or any other art form? Do you find that your hamminess ever leads to people not taking you seriously? I met Michael Stipe, and he’s my hero. Why Michael Stipe? I only know you through your music, but I would’ve never guessed him. music scene mostly consisted of wedding bands and weekenders who mostly covered Top 40 hits. where that was emanating from – I soon started a band called LOL, with Andrew Morse. We covered REM and The Police with two originals. I felt like I was Bono! My fate was sealed! did this all happen very recently? the things we do when we’re young! Man what a dumb name. Named it after the term was phrased. I though it meant “Laugh Online”, does it? 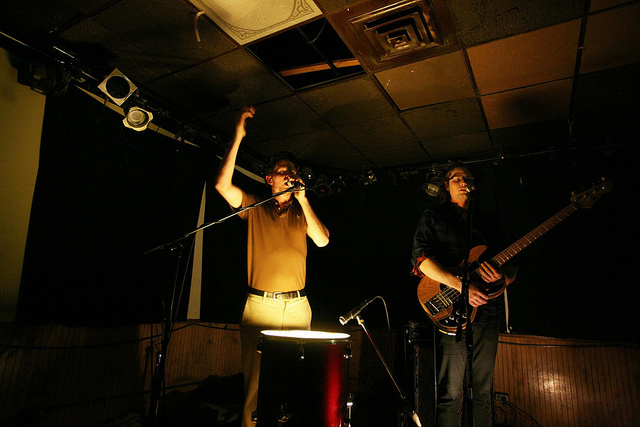 can expect for Ed Schrader’s Music Beat? Will there be some Jazz Mind tour support? Pitchfork is, or what he “should” like – he just wants to be blown away – that’s our guy. This next album’s for him, and it’s gonna have to be a monster. At this rate, we’re touring about six months out of the year with constant shows in between. We’re about to hit North America for six weeks, then off to England and Europe for five weeks. been supporting this record – it’s our job and we love our job!